This penetrating and inspiring book probes the psychological and emotional aspects of chronic illness and reveals how those who endure adversity ultimately achieve meaningful live. It eloquently demonstrates that happiness and fulfillment are not exclusive preserves of the healthy. 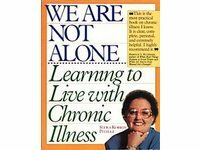 "Chronic illness doesn't come with an instruction manual," says Susan Milstrey Wells--so she wrote one. Afflicted with Sjögren's syndrome (an autoimmune disease that dries the eyes and mouth), fibromyalgia (a painful muscle disorder), and interstitial cystitis (a chronic inflammation of the bladder), she knows the ins and outs of coping with chronic illness. In A Delicate Balance, she provides a compelling mix of useful information and real-life stories (including an appendix of resource numbers for various medical and self-help organizations) to help others find the will and the way to survive and thrive. Books about Hypoglycemia from amazon.com. Do we really know what's good for us? "Yes!" the author of this book would yell, and in about as profound and important a way as could possibly be imagined. This is one of a series of books and programs that Marcia Emery has written on the subject of intuitive healing. Her basic premise is that each of us has an inner guide--an "inner physician"--whom we need to learn to access and listen to. Why? Because, says Emery, this inner guide (essentially, our own intuitive mind) can help us maintain health, predict and avert health problems, suggest remedies in times of illness, and steer us towards a healthier way of functioning that will offer long-term prevention. Emery describes intuition as "that unerring and inexplicable knowing beyond logic and volition. It lies at the roots of spontaneity, humor, creativity, inspiration, and even genius. And it is an especially powerful ally in the healing process." It is how scientists make groundbreaking discoveries, and how native peoples discover healing plants in the wild. Not long ago, Karen Duffy was sitting on top of the world and loving it. From calling bingo in a nursing home, she'd taken the express elevator to the penthouse overlooking Success Street. She worked as a VJ on MTV, as a spokesmodel for Revlon, as a film actress in Dumb and Dumber and other movies, and as a correspondent on Michael Moore's irreverent, Emmy-winning TV Nation. She was selected as one of People magazine's "50 Most Beautiful People in the World" in the same year she won the Ernest Borgnine Lookalike Contest. Although she had a serious disease, Duffy soon realized that the only way for her to survive was not to take the disease too seriously. Instead of hiding from life, she chose to run toward it. She learned to embrace the chaos of a life-threatening disease with a wit and humor that helped her to find the love of her life at a time when things seemed darkest. Model Patient is a gripping, inspiring, and hilarious memoir that recounts the singular triumphs and tragedies of coping with a chronic, life-threatening disease. Model Patient is an unforgettable, illuminating story that captures Duff's indomitable joie de vivre, revealing how she lives and how she has survived. One of the most helpful books about chronic illness that I ever run across....This book is captivating, informative, and sensitive. An invaluable source of help and comfort to those who suffer from invisible chronic illness and to their caregivers and friends. Discover the amazing secrets of the thyroid gland and learn how managing it can control arthritis, obesity, depression, diabetes, cancer, heart disease, circulatory conditions, impotence, and Alzheimer's disease. Fully updated, this classic work presents simple, effective ways to manage one's thyroid and make the most of life. Consumer text on low thyroid function, or hypothyroidism. Discusses how to determine if a person suffers from low thyroid function, the connection between the thyroid and the mind, how to differentiate between low thyroid function and hypoglycemia, the truth about synthetic thyroid hormone, and simple treatments to use. This is an essential layperson's guide to coping with chronic illness-- or the 50 million Americans who suffer from diseases such as arthritis, diabetes, and multiple sclerosis, and for the people who care for them. Sefra Korbin Pitzele is Secretary of the National Sjogren's Syndrome Association and serves on the Operations Committee of the Minnesota Chapter of the Lupus Foundation of America. She is co-founder, co-publisher, and Vice President of ADVANTAGE: A Magazine for People with Chronic Health Conditions. She is often the featured speaker at healthcare conferences and on radio and television shows. MaryO'Note: I love this book and I'm so glad to see it back in print. I've bought copies for everyone I know who might benefit from this - and that's practically everyone!